Just came back from Weight Watchers meeting. The scale showed no movement. If you are the "The glass is half full" type of a person. Then you will tell, "Aahhhhh @ least you didn't gain." then you will be thinking like me today. favorite Ramen noodle for the scale to not move??? But then again, I did eat some Banh Mi Pate and I feel a lot better now. And so it goes on. Next week will be better. Since I didn't show any progress, I wanted to show you a picture of someone who did. 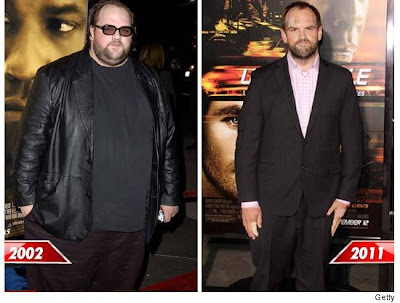 This guy is the Fat guy in That show Earl something (too lazy to figure out the right title) & the scary Goth looking friend in the Ashton Kutcher movie, Butterfly Effect. This took him over five years. God, I hope it doesn't take me that long. The first thing I thought was he's the fat guy from Mallrats, the one staring at the 3D picture. What ever happen to those anyhow?